Earlier today, Spanish Leadership Intern Javier Elorriaga and I surveyed Black and Turkey Vultures in eastern West Virginia. The next four days will see us surveying them in southern West Virginia, western Virginia, eastern Tennessee, and western North Carolina. The two of us started the frigid day at a hotel in Washington, Pennsylvania, just south of Pittsburgh, where it was very cold outside. Indeed, the temperature, which was -3 as we began packing the vehicle at 6:30 am, made it the coldest day Javier had ever experienced. Our plan was to drive an hour or so south to Morgantown, WV, where we would begin a south-bound, 170-mile road survey toward Lewisburg. Several inches of old snow covered the ground. Our questions for the day were: would we see any vultures, and what kinds would they be? We knew the birds were there, but would they leave their protected roosts to search of food, or would they simply hole up and wait for warmer weather? Equally important, would there be more Black Vultures than turkeys, something that had surprised us last winter given the former’s more southerly range in North America. Both questions were answered as we entered Elkins, WV, at 11 am and Javi spotted a single Black Vulture flying over “the downtown.” Seconds later we counted 10 more Blacks along the same flight line. Given their focused flight, almost certainly the birds were leaving a roost on the eastern outskirts of town for feeding grounds to the west. They were up and “aloft” alright, but considerably later than usual, most likely due to the morning’s sub-zero temperatures. There were no Turkey Vultures to be seen, nor had there been any Turkeys earlier in the day. Indeed it was not mid-afternoon when we were within 10 miles of Lewisburg, near the end of our survey, that we saw our first Turkey Vulture: a single individual perched atop a snag in the middle of a field together with a single Black Vulture. The two made an odd couple indeed. By the end of day we had seen 16 vultures, and all but two of them had been Blacks. The surprising result from last January—more Blacks than Turkeys—seems to be repeating itself, at least on this, the first day of our work week. Although we began our surveys in 2004 with the goal of using the results to monitor seasonal populations of Black and Turkey Vultures throughout North America, our preconceived notion that Turkeys would overwinter farther north than Blacks is not necessarily being confirmed. Why some of our birds are “misbehaving”—at least in terms of the literature—is still not clear. Nevertheless, the fact that they are indicates that we are far from understanding the intricacies of their geographic ecology. I will be adding additional updates shortly, so please stay tuned. In the interim, one thing is certain, I will be revisiting the region next January for another look. It wasn’t supposed to be this windy! The Falklands are known for their winds, especially in summer. But the winds that greeted us this morning were stronger than usual. And it wasn’t just us. Falkland Islands Government Air Service (FIGAS) had placed all inter-island flights on hold, and the gale-force breeze that we faced at 6am would eventually build to a hurricane-force wind by late-afternoon. High winds or not, our goals for the day were to begin field observations in earnest, and a little wind was not going stop us from our appointed rounds. An inquisitive Johnny Rook (Green right) waiting to be released after banding. It also would be the day we started assessing the feeding status of each bird that we saw. The latter was important for several reasons. Ostensibly, it would provide information on when during the day, birds would be easiest to trap: the assumption being that hungry birds would be easier to trap than satiated birds. Assessing feeding status also would allow us to measure how much food was available to the birds. The later would be particularly important when our summer data were compared with the results of similar observations we plan to make next winter, at a time when young Johnny Rooks are thought to be food stressed to the point of starvation. A sub-adult Johnny Rook with a full crop. Sunrise comes early in the Falklands in December. We were up at 4:20, and fed and showered in time to begin our first survey at 5am. In little over an hour we meandered through the 22 or so sub-colonies of Gentoo Penguins looking for rooks, vultures, and skuas. Although skuas were not one of our focal species, we needed to get a feel for population at The Neck, as these belligerent and sometimes predatory gulls compete with rooks and vultures both as scavengers and predators on penguins. We saw six Turkey Vultures, seven Johnny Rooks, and about 40 skuas flying over or standing near the edges of the sub-colonies, which were spread across an area of almost half a square mile of sand dunes and peat hummocks. All of the rooks were juveniles or subadults, while all of the vultures were adults. The skuas, some of which were breeding at the site, included both adult and sub-adult birds. By 6:30am the wind had picked up considerably, it began to rain, and we decided it was time to retreat to the cabin for some hot tea and news of the building storm. The winds continued to build over the day, and what initially was forecast as a Force 9 gale whipped it itself into a Force 12 hurricane by late afternoon. Walking back to the container cabin in late afternoon against 84 miles-per-hour head winds was about the same as running up a steep hill. It quickly became apparent why Olympic skaters race with their hands and arms tucked behind their bodies. It sure does reduce the rush of an oncoming wind. By 6pm, the individual whitecaps we were seeing earlier in the day had all but disappeared into a continuous meringue that made it difficult to separate the sea from the sky. Walking outdoors was out of the question and we were beginning to wonder whether or not our container lashes would hold our cabin down. Darkness came none-too-soon and we woke the next day to winds in the 40-50 mph range. We had survived the storm. But what about the birds? Johnny Rooks lining up at the trap for the opportunity to become part of the study. We were out again early, this time to catch some Johnny Rooks. Our plan was either remarkably simple or naïve. We would walk up to a group of the pathologically inquisitive birds, which had been approaching us to within a few feet since the day we arrived , set our trap, and catch a few of them. Oddly enough, the plan worked even better that expected, even in high winds, and even though most of the rooks had full crops, thanks to loss of so many penguin chicks in the storm the night before. Our trap was both simple and sticky. The former meaning that it was easy to build, and the later meaning that birds going for the bait associated with it got “stuck” to it. The fact that the trap could be carried in a shirt pocket made it eminently transportable as well. The “noose string” trap we used consisted of a series of 8-inch diameter, 80-lb monofilament fishing-line slip nooses equally spaced and securely knotted along a 6-foot-long piece of parachute cord. The noose string was set in a V-shaped, two-sided triangle with the bait (mutton in our case) spiked to the ground in the center. Birds approaching the mutton were supposed to become snared in one or more of the nooses. After about 40 minutes of trapping, we stopped at seven birds hoping that next week we’d catch the rest (a total of 20 was the limit set by the Falklands Government during this experimental stage of the work) and place the more permanent alpha-numeric aluminum bands on them. 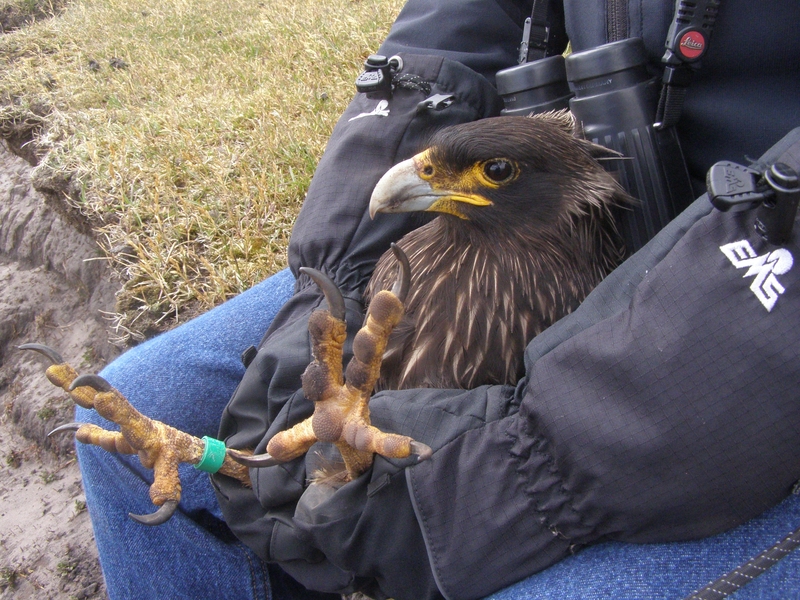 In the mean time, our plastic leg bands would allow us to assess the overall population size of Johnny Rooks as a result of resightings of them versus unmarked birds. We returned to the cabin for lunch, and spent the rest of the day assessing crop fullness in the birds we saw and looking for the birds we had just banded. That some were now banded made us feel as if we knew them personally. Tomorrow, the plan was to do more of the same minus trapping, plus some behavioral observations of scavenging behavior. I see my first vultures on the trip at the Guarulhos airport in Sao Paulo: a pair of Black Vultures sitting on the ramp lights at Terminal 2. My last chance to see the species will be at the airport in Santiago, Chile, as they don’t occur on the Falklands. The only vulture I will see there is the Turkey Vulture, a more broadly distributed species that likely has been marooned on the islands since they were connected to the South American mainland during last glacial maximum. The Neck on Saunders Island, home to colonies of thousands of penguins and dozens of scavenging Johnny Rooks and Turkey Vultures. Our container-cabin home is in the foreground. Holiday Inn Express to meet my colleague, Marc Bechard, who arrived from Boise, Idaho earlier in the day. After a late dinner, I hit the sack for a 4 am wake-up call and a 7 am Lan Chile flight to the Falklands via Punta Arenas, Chile. Waiting for the flight, I realize that in my haste to pack warm clothes—“summer” on the Falklands can be both cold and windy–I forgot to pack the radio transmitters and colored aluminum bands critical to the project. DHL delivers packages to the islands, but only on the weekly Lan Chile flight I am about to board. At best, the bands and transmitters will arrive next Saturday and be delivered to us on Saunders the following Monday, and that will happen only if all goes well in shipping them from the Acopian Center. We have plenty of other things to do on Saunders, but I do wish I had remembered to pack the bands and transmitters. Marc and I reach the Mount Pleasant Airport at 2pm Saturday afternoon where we are met and driven to the tiny capital of Stanley by Sam Cockwell, the young Falkland Islander who is managing the raptor project for Falklands Conservation. Sam is overflowing excitement about the logistics of the trip, as well as the tasks at hand. Fortunately, he not a bit put off about the delayed arrival of the bands and transmitters. 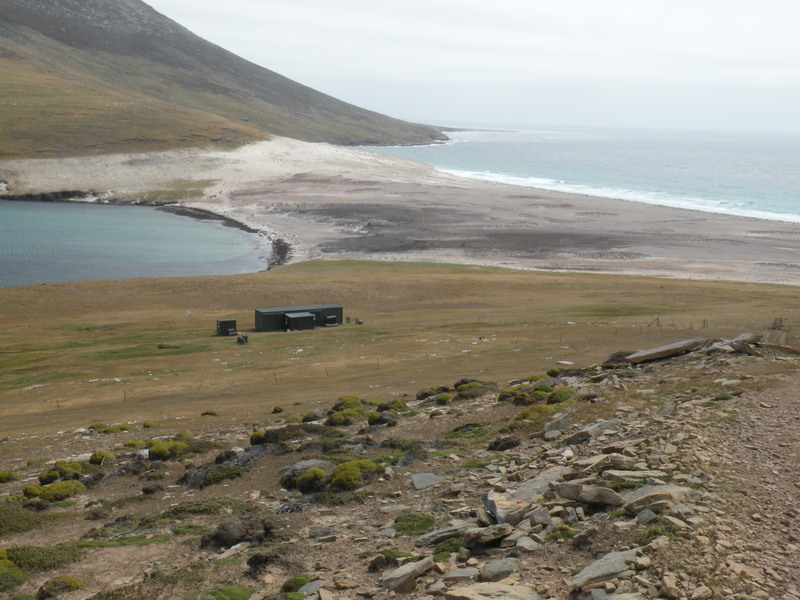 We spend the night at an apartment for visiting scientists in Stanley, and leave at noon the following day for Saunders on a Falkland Islands Government Air Service (aka FIGAS) six-seat, twin-engine Islander aircraft. Stiff cross winds make the hour-and-twenty-minute journey bouncier than usual, and all of us, including the pilot, bang our heads on the cabin ceiling during the trip. That said we drop out of the weather and land softly on the island’s 700-yard airstrip at near right angles to its long axis, delicately feathering from the sky head-on into the cross winds that had slapped us around en route. We meet our hosts–and the island’s owners–David and Suzan Pole-Evans at the plane, and shoulder our luggage to a small shed at the end of the runway, where we stuff ourselves into a red-and-white Rover Defender for the final leg of our journey: a six-mile, one-hour up-and-downer across peat bogs, streams, and a bona fide river of rocks, that takes us to The Neck on the north side of the island. 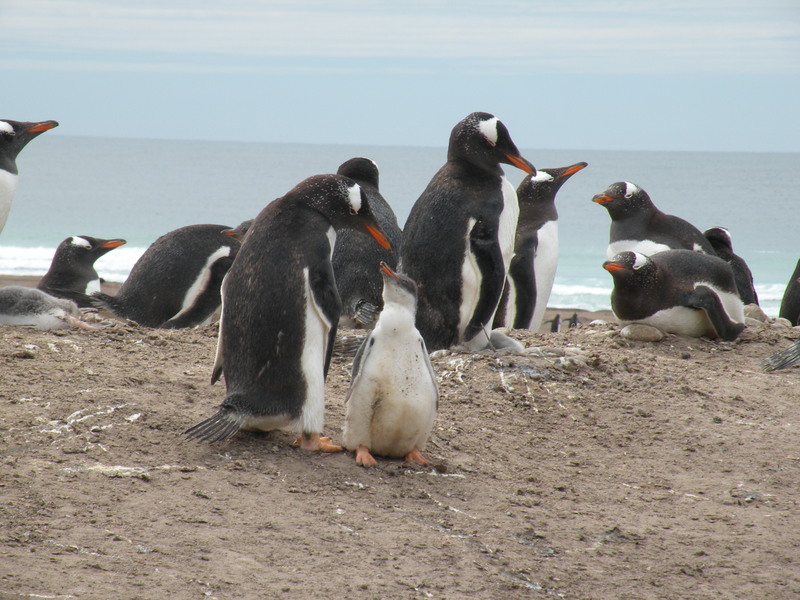 The Neck is a kilometer-long, low-lying, sandy wash-over that is home to more than 3,500 pairs of nesting Gentoo Penguins, hundreds of Magellanic Penguins, and a handful of King Penguins. 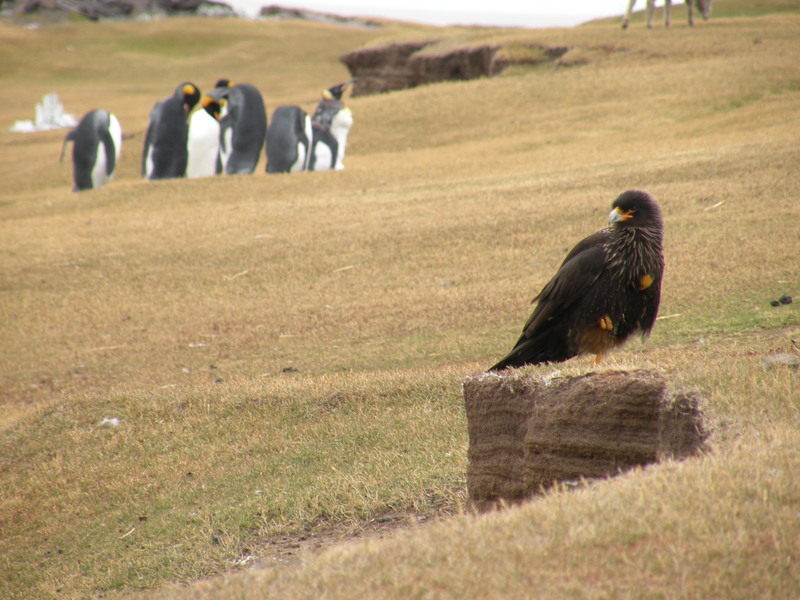 It also less than a kilometer from large colonies of Rockhopper Penguins, King Cormorants, and Black-Browed Albatrosses. Dozens of Striated Caracaras (aka Johnny Rooks) and Turkey Vultures, our target species, also dot the landscape, and, indeed, one the former approaches our Rover as we arrive. An inquisitive Johnny Rook with King Penguins in the background. We quickly dump our luggage in a container cabin and are out and about within minutes for a look-see at the penguins. Dozens of Johnny Rooks, most of whom are in juvenal or sub-adult plumage, and a dozen or so Turkey Vultures, all but one of which is an adult, make themselves obvious. An hour later we are back to base to unpack, plan our first full day in the field, eat dinner, and pass out. It is eight o’clock in the evening and I am sitting in the Newark Airport waiting impatiently for the first of four flights that will take me as close as I have ever come to the ends of the earth. My eventual destination is tiny Saunders Island, a 30-square-mile “offshore” spit of land in the Falkland Islands, 300 miles across the Atlantic from Argentina. 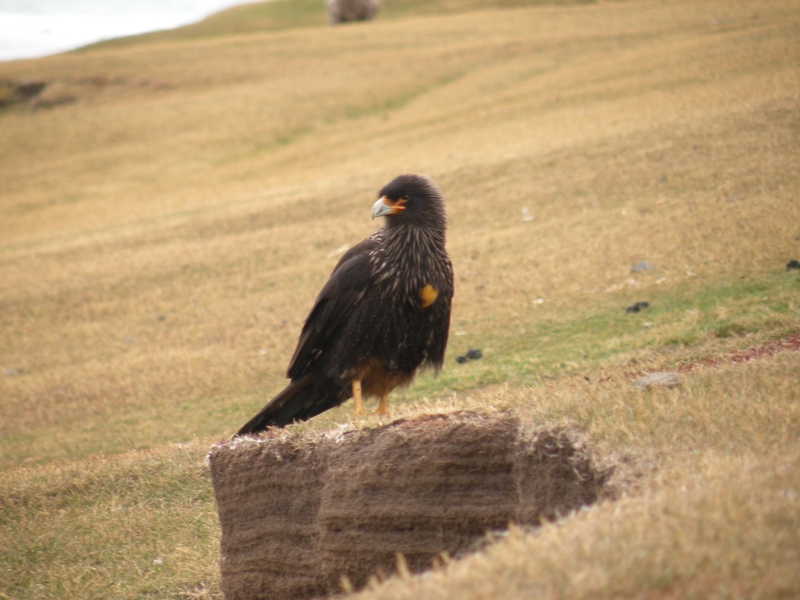 The island hosts huge colonies of Black-browed Albatrosses along with those of Magellanic, Gentoo, and Rockhopper Penguins, which attract scavenging birds, including Southern Giant Petrels, Turkey Vultures, and one of the rarest of all raptors, Striated Caracaras, or Johnny Rooks. 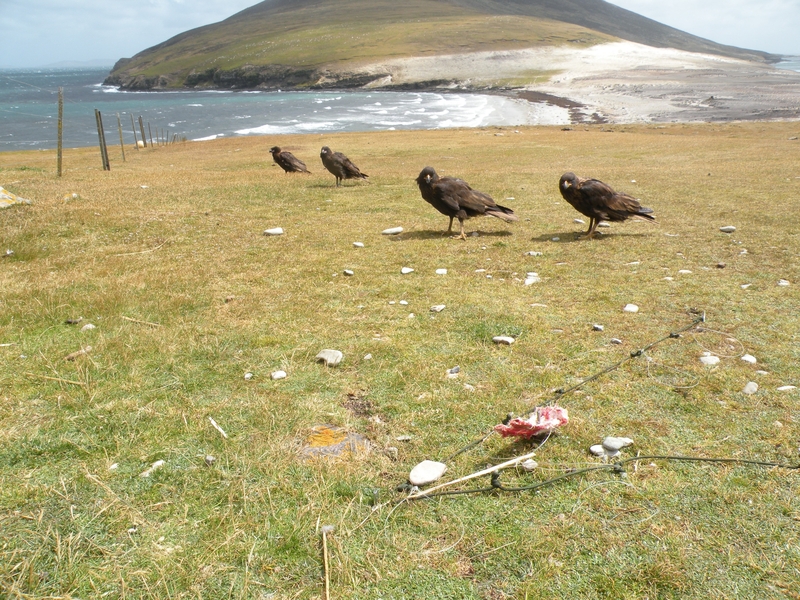 My professional goal is to help Sam Cockwell, a young Falkland Islander, figure out the extent to which these so-called scavengers actually scavenge–versus as kill–the birds (and sheep) they feed upon, and to assess the ecological consequences of their actions. My personal goal is to recapture the spirit of my graduate-student days… to camp out in the field surrounded by the birds I am spying upon. My baggage for the trip includes binoculars and the usual field gear, together with a down sleeping bag and inflatable pad, my laptop and a brand-new Kindle loaded with all of Charles Darwin’s major works, including The Voyage of the Beagle in which he recounts memories of his so-called “desolate” islands. Let’s hope the batteries don’t run out too quickly.